DC Direct has a long way to go before they catch up with ToyBiz. For $8, the Marvel Legends line gives us great sculpts, tons of articulation, highly detailed bases and a reprint comic. For more than twice as much, DC Direct gives us... well, their sculpts are usually pretty nice. Usually. DC heard fans' complaints and quickly turned things around for Series 2 and 3. However, it was Series 1 that had some of the most anticipated figures, particularly Superman and Wonder Woman. Who wouldn't have wanted that pair? As it is, only my devotion to anthropomorphic figures saved Hawkman from the Aisle of Misfit Toys. Some call him a savior, but those who deprive beasts and birds of their sanctuary call him a terror from the skies. His name is Hawkman. Hawkman's body is that of the Hawkgod, an extradimensional being whose physical might was the power source which fueled the famous "Nth Metal's" anti-gravity ability, but his soul was supplanted with that of the original, Golden Age Hawkman (a reincarnated Egyptian prince). This Hawkman cannot speak in a normal fashion. 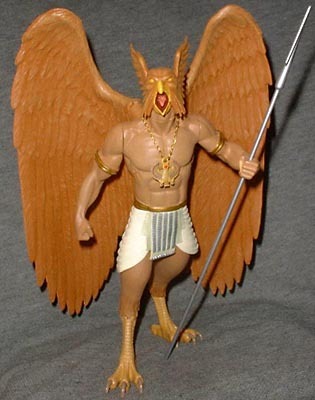 At about 8" tall, Hawkman was the first series' "big" figure. DC has never been a company that favored articulation over sculpt, and the Kingdom Come takes that to extremes - to best preserve the look of Ross' art, the figures move only at minimal spots. Hawkman is articulated at the shoulders, biceps, neck and wings, since there would be no subtle way to give mobility to those big chicken legs of his. Sadly, the lack of leg joints is Hawkman's biggest downfall - literally. In order to counter-balance his big wings, the figure leans drastically forward. Unfortunately, if you don't have his wings in just the right spot, he's thrown off balance and will topple forward. I had to replace mine after his foot broke off in a fall. While there's a hole on the bottom of his right foot, the figure does not include a base of any sort to help support him. Hawkman only has two accessories: an 8" silver spear and an Egyptian necklace. Hawkman's sculpt is probably the best in Series 1 - his joints all line up fairly well, his head looks like an organic version of the classic Hawkman helmet, and the giant wings are feathered nicely. The tan body and slightly orange feathers complement one another well, and the Egyptian-style skirt looks nice. With extremely pre-posed figures like this, the problem is that one small error at any time during the production process can really screw things up. More often than not, the pieces don't line up properly and you're left with an imbalanced figure that can't support itself. Even if Hawky had hips, the skirt would have hidden them, keeping the figure looking fine. Kingdom Come Series 1 was a pretty big disappointment - the true test of DC's care for their fans would be what they did with Series 2 and 3. How did such a promising line turn out so poorly? Tell us on our message board, The Loafing Lounge.